Sartorially speaking, there's nothing quite like that feeling of excitement and satisfaction you get when you manage to score a quality designer piece at a great price. Particularly when that item is trending, about to become huge, or will last you a lifetime. This season, there are a few items I've been eager to invest in: Think Carrie Bradshaw–style bags (baguettes, embellished shoulder styles, logo-covered picks), not to mention a supple leather jacket, gorgeous slouchy boots, silk scarves, and a posh pair of long gloves (they're trending right now, and they're très sophistiqué). I did a little digging at one of my favorite luxury consignment stores, The RealReal, to see if I could snag any of the items on my wardrobe wish list for less, and the e-tailer delivered. Scroll to shop the trending items I unearthed, and remember: They disappear quickly, so if you have your heart set on something, scoop it up ASAP! All your favorite fashion influencers are currently donning Dior's classic '90s Saddle bag. They've been all over our Insta feeds, and the trend shows no sign of slowing down. If there's an easy way to take on one of fall's top trends, it's with leopard-print shoes. This Manolo Blahnik pair is such a steal. If you've been on the hunt for the perfect leather jacket that'll last you forever, your search is over. This Iro pick is soft, supple, and versatile. Logo is a go this fall! 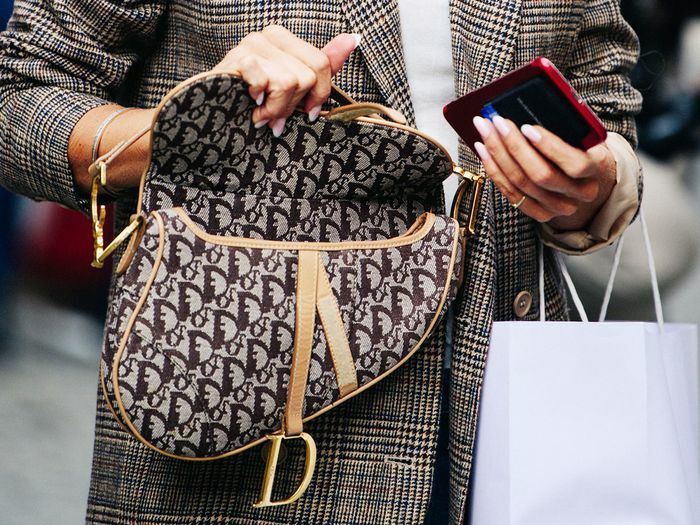 Wear your favorite designer's logo front and center on just about everything (bags, tights, tops—you name it). 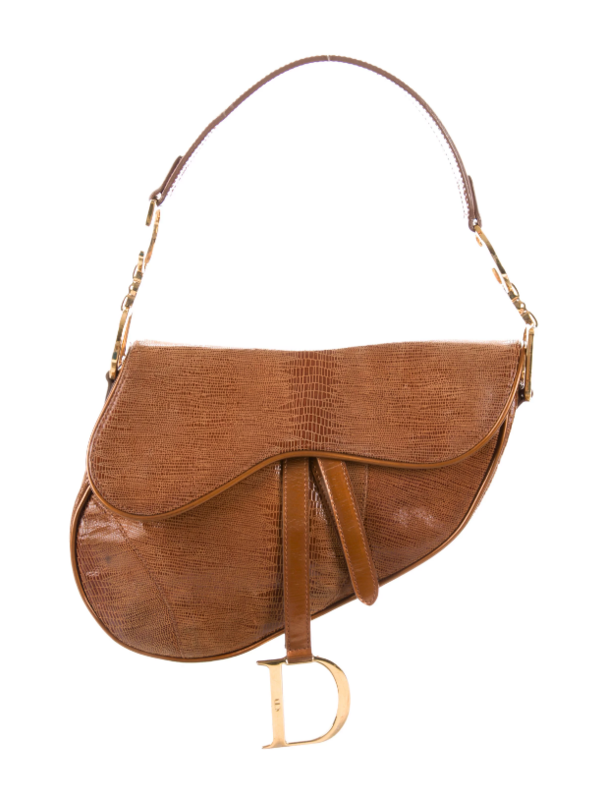 Chanel your inner Carrie Bradshaw with this chic Fendi shoulder bag. Fall and winter are all about gloves—preferably ones that extend to the elbow and come in practically every color. They may not be iPhone friendly, but they're insanely chic. Pair these work-perfect designer flats with a midi skirt or with cropped jeans. We're all about adding extra shine to our everyday looks. This gorgeous monogrammed bag is just the way to do it. ICYMI, Western-style boots are trending, and I can't get enough of this stylish studded, fringed pair. Whether wrapped, draped, or tied, this easy accent piece adds interest to any outfit. Silk scarves are one of the biggest accessories for fall. These futuristic silhouette will make any outfit instantly cooler. We're obsessed with these "naked" sandals here at the Who What Wear office—especially since they're priced at only $65! The jewel embellishments perfectly exude fall's glitzy metallic trend. I cannot wait to adorn my lobes with fall's must-have glitzy chandelier earrings. Dress up your jeans and tee with these danglers, or pair them with a trending '80s frock. Hands-free bags are the accessory du jour. Opt for a belt bag you can wrap over your blazer. Fashion girls love Balenciaga's pointed-toe mules, and in my opinion, they're perfect in hot pink (a key shade for fall). The catwalks were replete with plaid this season, from colorful preppy prints to neutral checks. A plaid blazer may just be the answer to any dressing dilemma. Earthy brown hues are putting us in the autumnal mood. Scoop these up while they're an extra 30% off. Up next, six fall trends I can't wait to wear.